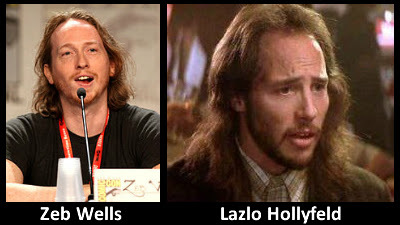 Is it just me, or does comic-book artist Zeb Wells (Spider-Man, Daredevil: Battlin’ Jack Murdock, Fantastic Four/Iron Man: Big In Japan) look quite a bit like basement dwelling über-genius Lazlo Hollyfeld from the movie “Real Genius”? Okay, I totally made up that word. Some things are obvious, like the level of awe you will express when you view the video of this cake. French artist of film, photo, and of course, confections, Alexandre Dubosc created this masterpiece of animated (animatable?) cake as a tribute to fellow artist, Tim Burton. Most impressively, if the theme of it weren’t enough, Dubosc created an animated ring around the cake depicting the Bat symbol from “Batman” and a pumpkin which could be taken as a reference to either “Nightmare Before Christmas” or “Sleepy Hollow”, of which I’ll choose the latter in my own perception because on top of the cake is a revolving, smiling “Jack Skellington” face. So, CBS has released a sort of behind-the-scenes/teaser/trailer for the American iteration of “Sherlock”. Personally, I like Johnny Lee Miller. So does Benedict Cumberbatch! They’re buddies IRL and have spent a good deal of time doing an amazing performance of “Frankenstein” where they’d switch off back and forth playing both Creator and Monster. So, we shall see come this fall. Should the show fall short, there’s always the 3rd Season of the BBC “Sherlock”! Happy Star Wars Day everybody! Wouldn’t be a proper Star Wars Day in this age without watching RvD2!! Seriously, the BEST fan-made, or likely, the best Lightsaber duel period! You owe it to yourself to watch this! 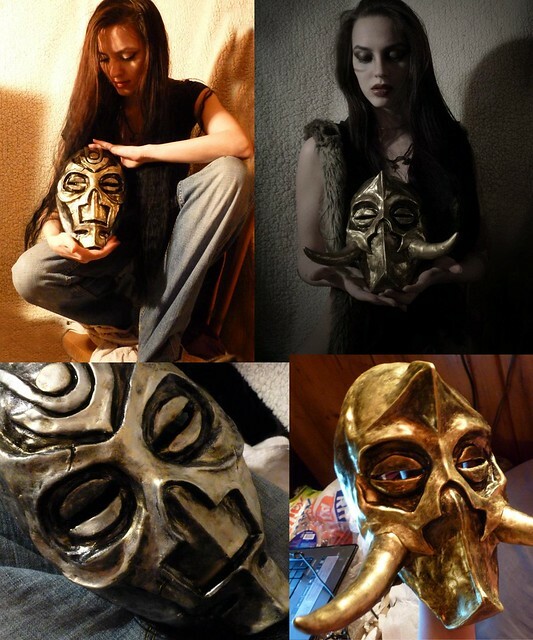 You too can make an awesome Dragon Priest masks from "Elder Scrolls V: Skyrim"
My pal Nicci (aka in certain circles, Björn-Lagmancer) just signed up onto tumblr (where this site is hosted fyi). Here’s her blog. She just sent this to me, it’s pretty rad. For such a nut, the girl’s got some great (read: pretty sick) artistic costume/prop making skills. To round out the post, here’s a pic of her in her Skyrim/Dovahkiin costume that she wore at a recent con (minding you, again, that she made herself). I’m thinking I might have to commission her to make some pieces for me.